German Hospital and church ("Evangelical Lutheran Church of the Ascension") on the north side of Mount of Olives. 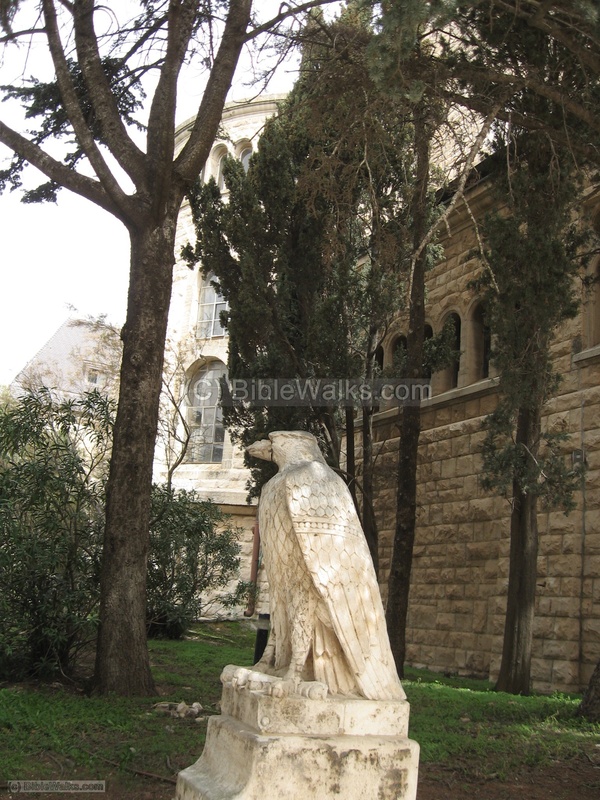 Augusta Victoria is a Hospital and Church located on the north side of Mount of Olives. It was built in 1907-1910, and named after Empress Augusta Victoria, the wife of German Kaiser Wilhelm II. Today it is an Arab Hospital. The ceremony of the establishment of a church and hospice was held in 1898 during the historic visit of the German Kaiser Wilhelm II in Jerusalem and the Holy Land. His visit to the Holy Land and Jerusalem was a great event in the Holy Land, and caused great excitement across the country. The 80 Dunam (8 Hectares) area on the north side of Mt of Olives was given as a present by the Ottomans , one of the three areas he received during this visit (the other places were the Dormition and an area in the street of the prophets). 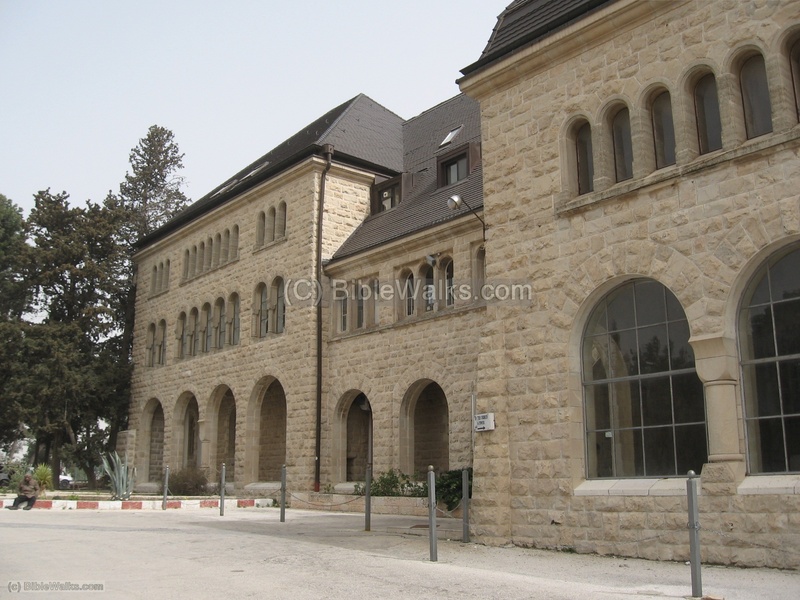 The newly conceived complex was named after his wife, Augusta Victoria, who toured the Holy Land with him. Augusta (1858-1921) was the princess of Schleswig-Holstein-Sonderburg-Augustenburg before her marriage to Wilhelm in 1881. Kaiser Wilhelm II was the last German emperor, ruling in 1888-1918, and gave up the throne after the German defeat of WWI. The cornerstone laying ceremony was held in March 1907. 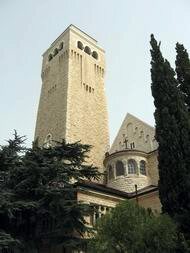 The large complex included a large Hospice building and a church with its 60M high bell tower. It was designed by the German architect Robert Leibnitz who was inspired by German palaces, and designed other grand palaces and hotels in Berlin and Germany. The complex was constructed in the years 1907-1910. The German Protestant church, which is part of the complex, was named as the "Evangelical Lutheran Church of the Ascension". The Royal couple returned to inaugurate the completed building and church in 1910. 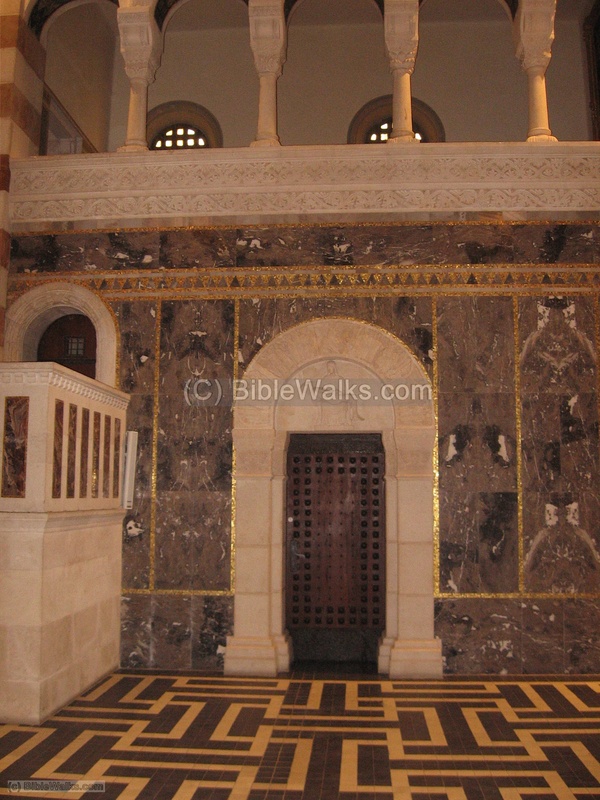 It was the first modern building in Jerusalem with electricity, powered by its own generator. The building initially served as a pilgrims hospice until 1914. During World War I Augusta Victoria was used by the Turkish army as headquarters during WWI (1914-1917). It is here that the Ottomans, led by Jamal Pasha, signed in December 1917 the surrender papers of Palestine to the victorious British forces, led by General Allenby. During the years 1917-1927 the hospice building served as a temporary HQ for the British forces , who occupied the Holy Land. The British occupation managed the country and Jordan, initially as an administration called O.E.T.A. (Occupied Enemy Territory Administration, 1917-1920) and later as the British Mandate (managed by a high commissioner, 1920-1927). Two commissioners served here - Herbert Samuel (1920-1925) and Lord Plummer (1925-1928). The British administration relocated in 1927 to the new commissioner's palace ("Armon Hanaziv") on the south side of the city. The British rebuilt the ruined country, introduced the city to the 20th Century, and left an important building code for which Jerusalem is highly praised: all its buildings city are required by a city ordinance to have a stone exterior - the Jerusalem stone - dressing the Holy city in a unique and uniform architecture style. Augusta Victoria was damaged by an 6.3 magnitude earthquake in July 1927 and later repaired. It was then converted to a hospital during World War II for the British forces. Throughout 1948-1967 it became under UN control in the buffer zone of Mount Scopus. In the 6-day war (June 1967) the second floor was destroyed by shelling during the bloody battles between the Israeli paratroopers 55th Brigade and the Jordanian Legion soldiers. It was incorporated into the unified city, and today it is used as a hospital servicing the Arab population. 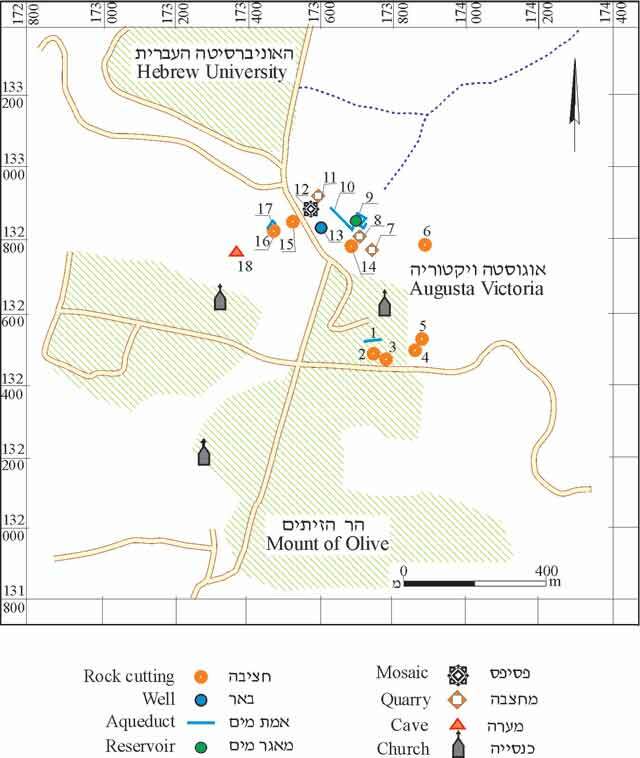 The complex is located between Mount Scopus and Mount of Olives, on the road that leads to the sites and churches of Mount of Olives. It has a strategic and high location, one of the reasons why the site was selected as the HQ of the Ottoman and British forces. 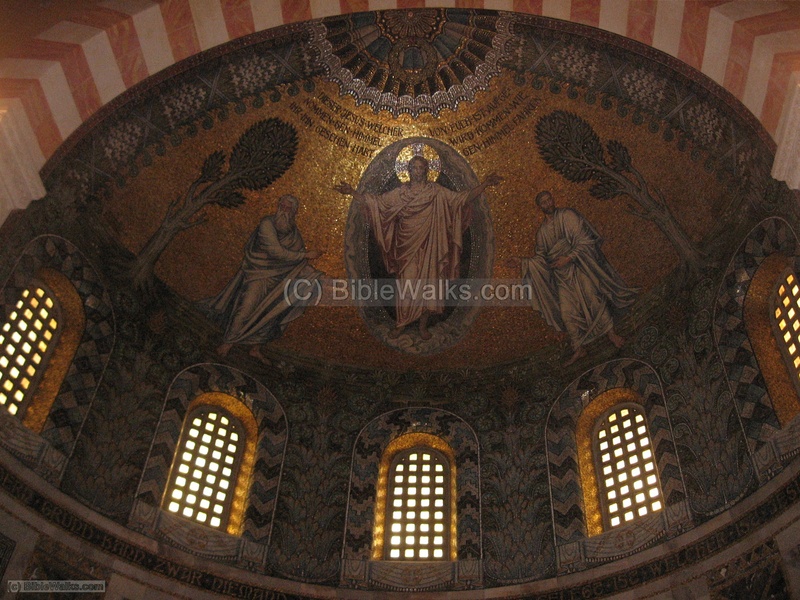 The church, on the south side of the hospital, is open to the public and is a nice site to visit on the way to the sites of Mount of Olives. The hospital on the north side of the church is seen in the following photo. It serves the Arab population of east Jerusalem. The bell tower of the church is one of Jerusalem's skyline landmarks. It towers 60M, and has four bells. 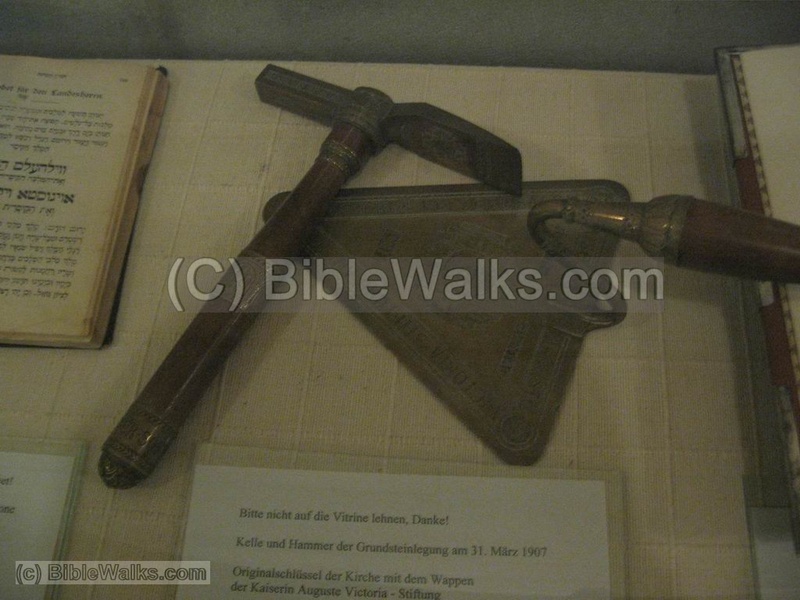 The heavy bells were imported from Hamburg and required rebuilding the road from Jaffa to Jerusalem. The garden on the west side entrance to the church, with the eagle statues. The eagle, with folded wings, is a German imperial sign. It was adapted in the 9th C AD by Charlemagne, the first Frankish king to gather the German Peoples into an empire, who placed a statue of an eagle on top of his palace. Since the 12th C the eagle represented power and unity and was incorporated on the German coat of arms. The photo below shows the south side of the church with the altar. 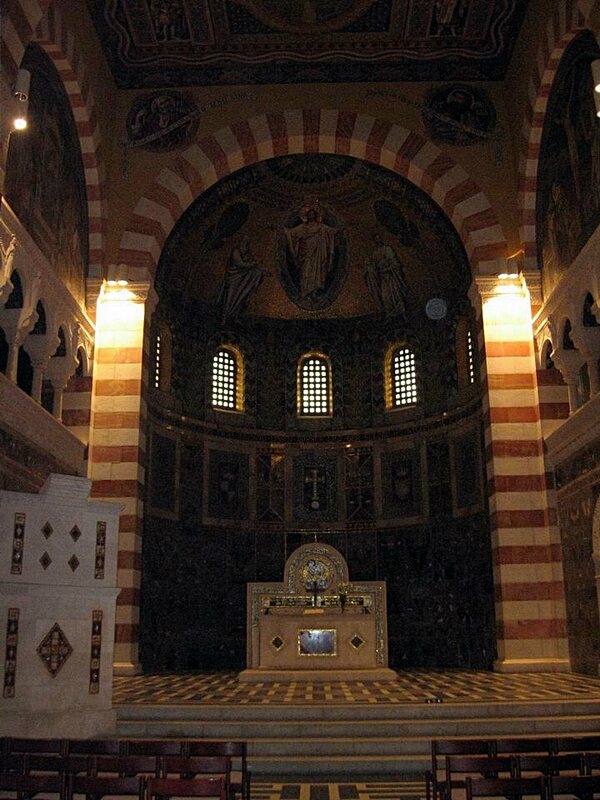 The beauty of the frescoes, mosaics and interior decoration are worth the visit. 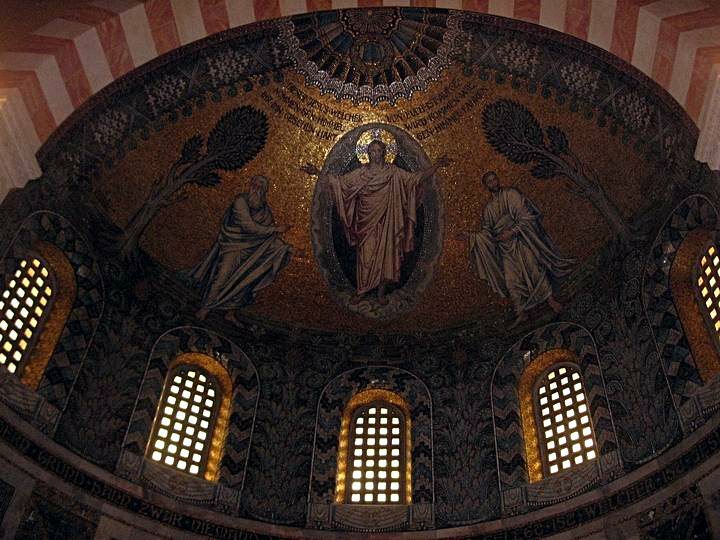 A detail of the ceiling of the dome above the altar is seen in the photo below. The main altar of the church is seen in the following photo. 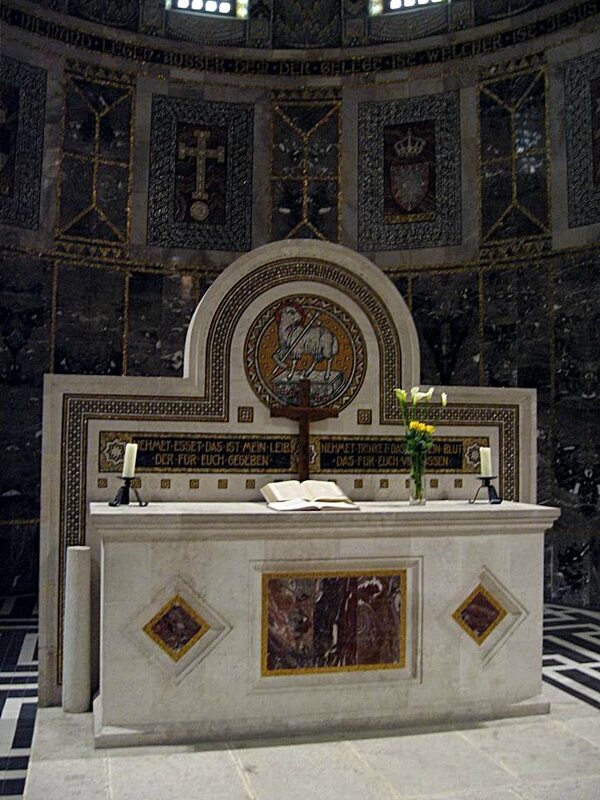 The Christian symbol of the lamb of God is seen above the altar. It is a common Lutheran icon, which is based on the verse (John 1, 29): "The next day John seeth Jesus coming unto him, and saith, Behold the Lamb of God, which taketh away the sin of the world". A door to the side room. To see a detail of the decorated door - press here. A door to the other side room, with a golden inscription, is seen below. 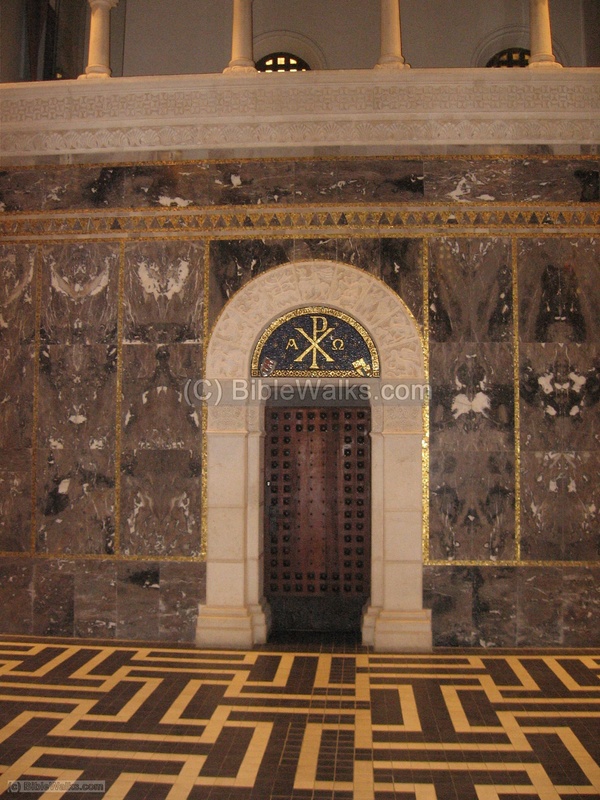 The Christian symbol includes an intersection of the Greek letters Chi-Rho, which represent Christ (the 1st 2 letters of Christos in Greek) and smaller Alpha-Omega letters (the first and last letters of the Greek alphabet, representing that God is eternal - spanning the beginning and the end). In the entrance to the church is a display of historic items from the history of Augusta Victoria. 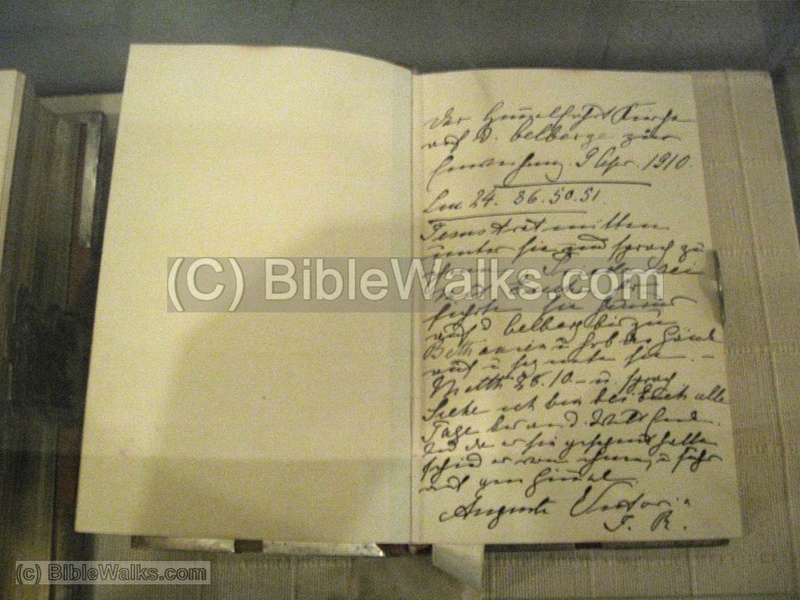 Two bibles are on display, including this one which was signed by Augusta in April 1910 in their second visit to Jerusalem, when they inaugurated the Church. 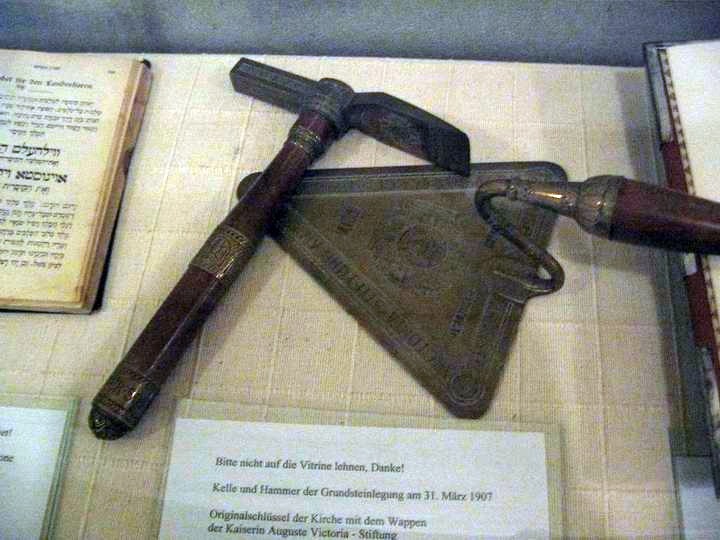 Other items of the cornerstone foundation ceremony (March 1907) are seen below.